Terms and definitions as used in early twenty-first-century Political Science in the United States of America. Politial Science Glossary: A, B, C, D, E, F, G, H, I, J, K, L, M, N, O, P, Q, R, S, T, U, V, W, X, Y, Z.
U.S. Modern History Glossary: A, B, C, D, E, F, G, H, I, J, K, L, M, N, O, P, Q, R, S, T, U, V, W, X, Y, Z. Note: this site is not giving legal advice, simply organizing information from various Political Science classes and texts. If you need legal advice consult your lawyer. Knowledge of a defamatory statement's falsity or a reckless disregard for the truth. A model of bureaucracy that assumes top-level bureaucrats attempt to expand the size of their budgets and staffs to increase their power. A federal, state, or local government unit established to perform a specific function. Such an agency is created and authorized by a legislative body to administer and enforce specific law(s). A term in the U.S. Constitution that describes the U.S. Senate's power to review and approve treaties and presidential appointments. Declare that a court ruling is valid; make a formal judicial declaration, but not under oath. A policy in job hiring or educational admissions that gives special compensatory treatment or other attention to traditionally disadvantaged groups (in an effort to reduce the present effects of past discrimination). Determining which [public-policy] questions will be debated or considered. Limitations of focus caused by agenda setting. A brief filed by a third party, or amicus curiae (Latin for 'friend of the court'), who is not involved directly in the litigation but has an interest in the case's outcome. Historically, a person in opposition to the ratification of the new Constitution in 1787. Anti-Federalists opposed a strong central government. Contrast with federalist. A court having jurisdiction to review cases and issues that were originally tried in lower courts. The authority vested in the president to fill a government office or position. Such positions include those in the executive branch and the federal judiciary, commissioned officers in the armed forces, and members of independent regulatory commissions. Passage by Congress of a spending bill specifying the amount of authorized funds that will be allocated for an agency's use. Rule by an upper class, which claims that it is 'best'. Compare with theocracy. The first act in a criminal proceeding: the defendant is brought before a court to hear the charges against him or her and to enter a plea of guilty or not guilty. A secret ballot prepared, distributed, and tabulated by government officials at public expense. Since 1888, all states have used the Australian ballot (rather than an open and public ballot). A regime of command and control by the ruler of the government. The government is fully controlled by the ruler. In contrast with a totalitarian state, some social and economic institutions exist outside of government control. The 'classical' authoritarian, which is the right-wing authoritarian (RWA), who is a follower, submits to psychological authority, and has self-righteous 'moral' standards and (often) a short-circuited conscience. The authoritarian leader with social-dominance orientation (SDO). The right to decide, command, and act, given to the government by the people who believe it has the right to rule. A formal declaration by a legislative committee that a certain amount of funding may be available to an agency. Some authorizations terminate after a year. Some are renewable automatically without further congressional action. A legislature that comprises two parts or chambers. The USA Congress is a bicameral legislature; its two chambers are the House of Representatives and the Senate. Compare with unicameral legislature. A tactic to smear the reputation of an opponent by outrageous allegations about his or her behavior or affiliations. E.g., used in the early 1950s by Senator Joseph McCarthy in his witch-hunt for communists in the federal government. First ten amendments of the US Constitution: Lists individual rights and liberties; specifies the three branches (legislative, executive, judicial), each with power to block some action by the other two. Federal funds granted to state and local governments for criminal justice programs, mental-health programs, and other general areas of service. Compare with Categorical Grants. A document containing a legal argument supporting a desired outcome in a particular case. In civil rights, the transportation of public-school students from the areas where they live to schools in other areas, in order to reduce school segregation based on residential patterns. An economic system in which the means of production and distribution are mainly in private ownership for private gain at the expense of the non-owners. Mechanisms include free markets and freedom of contract. Federal funds granted to state and local governments for specific programs or projects. Compare with Block Grants. Intelligence organization that deals with foreign threats and enemies. A principle of a system of government whereby each branch of the government can check the actions of the others. As originally conceived, this was true of the government of the USA. A nonviolent, public refusal to obey allegedly unjust laws. The law regulating conduct between private persons over noncriminal matters. The government provides the forum for the settlement of disputes between private parties in contracts, domestic relations, business interactions, and similar matters. Those personal freedoms that are protected for all individuals against the government. In the USA, the rights rooted in the Constitution's Fourteenth Amendment's guarantee of equal protection under the law. Clear and Present Danger Test. The test (proposed by Justice Oliver Wendell Holmes) for determining when government may restrict free speech. Restrictions are not permissible unless speech presents a 'clear and present danger' to public order. A section of the Constitution that assigns to Congress the power to regulate trade among the states and with foreign countries. Advertising statements, which increasingly have been given First Amendment protection. Judge-made law (originating in England) from decisions shaped according to prevailing customs. Decisions were applied to similar situations and then gradually became common to the nation. "From each according to his abilities, to each according to his needs." Powers held jointly by the national and state governments. A league of independent states, each having essentially sovereign powers. The central government created by such a league has only limited powers over the states. A voluntary association of states; usually limits central authority to foreign affairs and is less permanent than a federation. A political system where states or regional governments retain ultimate authority, except for powers expressly delegated to a central government. Ensured the support by the smaller states (as well as the larger) for a strong central government. The fundamental law of a nation. Defines the power of the government; specifies offices and their authority. Governments and laws are legitimate implicitly from the consent of those governed. A selfish right-wing approach that minimizes national government help of individuals and promotes traditional values and lifestyles. Thus Conservatism opposes change unless it reduces government support of individuals or regresses to even more traditional values and lifestyles than are in place. The theory that the states and the national government should cooperate in solving problems. A place where justice is administered. Law that defines crimes and provides punishment for violations. In criminal cases, the government is the prosecutor because crimes are against the public order. The amount by which a required sum of money is short. A national deficit is established by borrowing against the issue of government securities, to allow governmental expenditures to exceed receipts. See also: recession, (budget) surplus, fiscal policy. A republic in which the representatives elected by the people make and enforce laws and policies. Transfer of powers from the national or central government to state or local government. This happened in the United Kingdom in the late twentieth century. Reduction of discord between nations. Example: U.S.A.-Soviet relations that developed under U.S.A. President Richard Nixon and his Secretary of State Henry Kissinger. The art and science of conducting negotiations between nations. A system of government where political decisions are made by the people directly, rather than by their elected representatives. Values, customs, and language of the group(s) that control politics and government in a society. The speculation that society is ruled by a small number of people who exercise power to further their self-interest. The political idea that all people are of equal worth. Goods and services produced domestically and sold or traded abroad. Contrast with imports. Exalts an absolute ruler (dictator). Glorifies war, merging the interests of state, armed forces, and big business. A system of government where power is divided between a central government and regional, or subdivisional, governments. Each of those levels has a domain where its policies are dominant. And each has political or constitutional guarantee of authority. A political system in which authority is shared between a central government and a state or regional government. An association of states; usually more permanent than a confederation. A political system where states or regional governments retain ultimate authority, except for powers expressly delegated to a central government. [Dollar] value of all final goods and services produced during a one-year period. The establish form of rule and ultimate authority within a society or a nation. The institution that has authority and that makes decisions to resolve conflicts or allocate benefits and privileges. Merger of competitors in the same industry. Contrast with vertical integration. A world view or set of comprehensive beliefs about people and the role of government. Goods and services brought into a country from abroad for commercial purposes. Contrast with exports. Citizen petition of a measure put on the ballot. A policy that advocates national self-sufficiency and freedom from international affairs or alliances (political and economic). School of economic thought that favors active federal government policy-making through discretionary fiscal policy to stabilize economy-wide fluctuations. That part of government primarily responsible for making laws. Acceptance by the citizens of the right and power of a government or ruler to exercise authority. Democratic government that provides for the protection of individual human rights, in order to prevent a majority from oppressing a minority. Advocacy of positive government action to improve the welfare of individuals, support for civil rights, and tolerance for political and social change. A political ideology of skepticism or opposition toward most government activities. The fullest freedom of individuals consistent with the freedom of others in the society. A government whose powers are limited, particularly by institutional checks. The government ought to do what the majority of the citizens want. In any political unit, support by the greatest number of citizens selects officials and determines policies. Manipulation of changes in the amount of money in circulation to adjust credit markets, employment, and the rate of inflation. Assumption that nations as willing to cooperate and agree on moral standards of conduct. Rights held to be inherent in natural law, rather than dependent on governments. As such, there is the danger of claims being made akin to religious beliefs. John Locke claimed that natural law is superior to human law, and that it includes rights of 'life, liberty, and property'. These rights (modified to 'life, liberty, and the pursuit of happiness') are asserted in the Declaration of Independence. Development of nuclear weapons by nations that did not have them before. A state of peace and security, maintained by protecting citizens from violence and criminal activity. Representative democracy where political power is vested in an elected legislature. Used in most European countries. Expression of party-based ideologies and policy priorities, which may lead to conflict in the political system. A social condition where different racial, ethnic, and religious groups are intermingled geographically. Also a theory of politics as a conflict among interest groups, where political decision making requires bargaining and compromise. Beliefs and attitudes of a community or nation toward government and the political process. The process by which citizens learn political attitudes and form opinions about social issues. Important forces in this process are the family and the educational system. 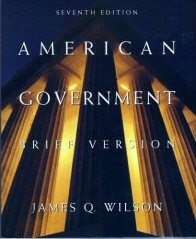 The art and science of government and conducting the affairs of a state. Also the struggle for power within organizations and informal groups that can grant and withhold benefits or privileges. The management of conflict over who will run the government and to what ends. Each nation acts principally in its own interests. The ability to force someone to change one's behavior, no matter what their wishes. Ultimate political authority is based on the will of the people. Representative democracy where political power is vested in separately elected and appointed branches of national government. This system is used in the USA. A tax that is an increasing percentage as income rises. Compare with: proportional tax and regressive tax. Any thing that can be owned. Political philosopher John Locke considered that the right to property is a natural right (superior to human law made by government). A tax that is a constant percentage as income rises. Compare with: progressive tax. regressive tax. An election procedure that allows the people to vote to dismiss an elected official from state office before his or her term has expired. Legislative or constitutional measures referred by the legislature to the voters for approval or disapproval. A tax that is a decreasing percentage as income rises. Compare with: progressive tax. proportional tax. A legislature composed of individuals representing the population. A form of government in which sovereignty rests with the people (or a portion of the people), as opposed to a king or monarch or dictator. This form of Representative Democracy was created by the framers of the US constituion. The division of governmental functions and powers among different branches of government, so that the various self-interests of each group would moderate those of the others. 1787: Soldiers of the Revolutionary War were led by Daniel Shays to prevent foreclosure of farms as a result of high interest rates and taxes. This rebellion highlighted the weakness of individual states in such situations and the need for a federation. A voluntary agreement among individuals to establish and secure their rights and welfare by creating a government and abiding by its rules. An example of a regressive tax. Public collective ownership and control of the means of production, distribution, and exchange. Also viewed as a political ideology based on strong support for economic and social equality, in a society where major businesses are taken over by the government or by employee cooperatives. A group of people occupying a particular region and organized under a single government; a nation or a subunit of a nation. Aid, usually money or of monetary value, given by the government to support a public service. In-kind subsidy: Goods or services (food stamps, housing, medical care, etc.) provided by a government to low-income groups. The right and privilege of voting; the franchise. The provision in the Constitution that makes the Constitution and the federal laws superior to any conflicting state and local laws. See progressive tax, proportional tax, and regressive tax. Also: Estate Tax, Federal Corporate Income Tax, Federal Income Tax, and social security tax. Rule by a god, which in practice means rule by a priesthood. No separation of church and state. Compare with aristocracy. A regime of command by the government and obedience by the citizens. The regime controls all aspects of political and social life (as in George Orwell's 1984). In contrast with an authoritarian state, all social and economic institutions are under government control. A legislature that comprises a single part or chamber. In the USA (early 21st century) only the state of Nebraska has a unicameral legislature. Compare with bicameral legislature. A centralized governmental system where local or regional governments exercise only the powers that the central government gives them. The right and privilege of all adults to vote for their representatives. Disclaimer. Copyright © 2006-2010 by J. Zimmerman.